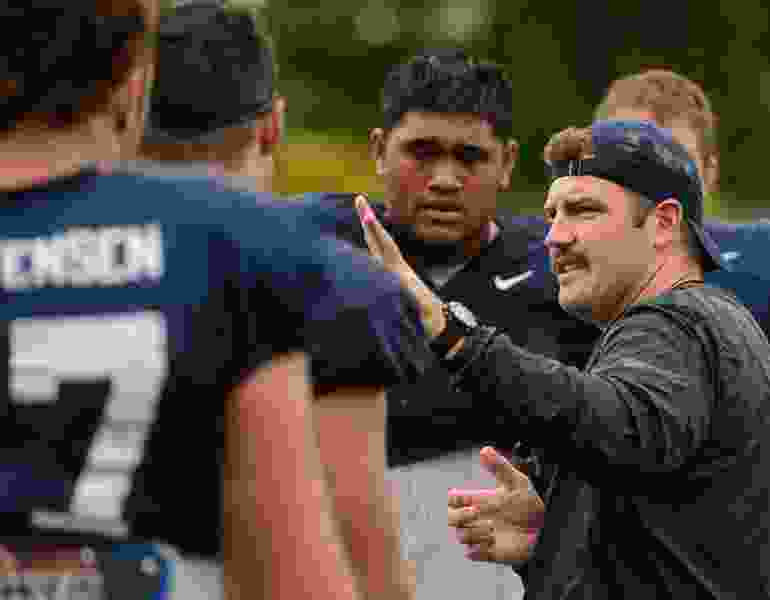 (Trent Nelson | The Salt Lake Tribune) BYU's new offensive line coach Ryan Pugh at football practice in Provo, Wednesday Aug. 15, 2018. Provo • It appears that BYU football coach Kalani Sitake’s staff will not stay intact after all. The website FootballScoop.com is reporting that BYU offensive line coach Ryan Pugh will become the offensive coordinator at Troy under newly hired head coach Chip Lindsey. Pugh is an Alabama native who played center at Auburn from 2007-10 and was a member of the Tigers’ 2010 national championship team. He has been a graduate assistant at Auburn, Virginia Tech, Cincinnati and LSU and was the offensive line coach at Texas-San Antonio before BYU hired him last winter to replace Mike Empey. Pugh was lured to BYU by his mentor, Cougars offensive coordinator Jeff Grimes, and spent just one year in Provo. He helped develop two freshmen All-Americans for the Cougars in 2018. Center James Empey was named a first-team freshman All-American by the Football Writers Association of American and tackle Brady Christensen was named a second-team freshman All-American. Troy hired Lindsey as its head coach last month after Neal Brown left for the West Virginia job vacated when Dana Holgorsen went to Houston. Mike Empey and BYU graduate assistant Dallas Reynolds are considered candidates to replace Pugh at BYU. Reynolds was added to BYU’s staff in the summer of 2017 after he played in the NFL for seven seasons with the Philadelphia Eagles and New York Giants. He was a four-year starter at BYU and a first-team all-Mountain West offensive tackle his junior and senior seasons. He is the son of longtime BYU assistant coach Lance Reynolds.